At the Landmarks Commission meeting on February 28, just before I spoke, a woman and her husband got up and gave a pretty impressive and informative talk, complete with photos, about the wetlands that are being destroyed by the Beale Street Landing project. Most urbies probably don't understand the multi-layered importance of the wetlands at the north end of Tom Lee. I've come into possession of her speaking notes and reproduce them below. Click here to read her remarks. Standing on the cobblestone area, looking south, in September 2005. Both sides of the harbor are visible. The Mississippi is at relatively low water level. Photo ©2005 by Sue A. Williams. Definition. It is a "place where the ground is saturated or that is partially or completely covered by water some or all of the year". (US Fish and Wildlife Service). It is "land that is transitional between aquatic and terrestrial ecosystems and is covered with water for at least part of the year" (US Dept. of the Interior, US Geological Survey). Function. It provides protection against sediment deposits, filters runoff and supports wildlife. Observation. It contains vegetation (for example, trees, bushes, grasses) composed of plants adapted to grow in a place where the ground is saturated or completely covered by water during some of the year. It also provides a natural environment where wild birds (including migratory) collect and breed; it acts as a wildlife and aquatic habitat. 2) It is a Buffer. To be more specific, it is a Riparian Buffer, AKA a river's best hedge against pollution and erosion. It is located at the end of a large and significant city storm drain. It traps pollutants that would otherwise wash directly into the Mississippi River. It helps catch and filter out sediment and debris from surface runoff. It slows the velocity of runoff, which otherwise could disturb aquatic life. It helps stabilize the riverbank and reduces erosion, its root systems protecting the bank by deflecting both the undermining action of river current and the cutting action of the wakes of the multitude of boats that enter and exit the Mississippi River at its location. This wetland is a home to at least 30 to 40 doves. It is the nesting site of several migratory red wing blackbirds. At our home, we set up a feeding station for birds that provides birds with enough sunflower kernels (not seeds) to make their lives a little bit easier without interfering with their natural process of finding food (insects, seeds, etc.) elsewhere. Several red wing blackbird pairs, which nest in the wetland trees, appear at the feeder in spring and disappear in late August. They fly in from the wetland, eat some of the kernels and fly back to feed their young. The doves live in the undergrowth of the wetland and also frequent the feeder. Other wetland visitors and residents include wild ducks, sea gulls and Great Blue Herons. I also have noticed the presence of a large number of a specific butterfly species which lives in and among the wetland grasses and wild flowers. Knowing a fair amount about swallowtail butterflies because we have been blessed with their laying there eggs in our parsley, I am sure the wetland butterflies use its grasses and flowers as a place for reproduction as well as habitation. In addition, there is a dirt trail through the northern most part of the wetland area that leads to the water's edge. This trail was trod by people coming to try to catch the fish who live among the root systems and submerged grasses. To destroy this wetland habitat would mean to destroy the only habitat of it's kind anywhere along the downtown riverfront, and rob these wonderful creatures of a place mother nature provided for them in which to live; there is no other place in the entire downtown/riverfront areas for them to go. There is a provision that another wetland area will be created somewhere not close to here to make up for this one being destroyed. Everything I have read, Including a study by the state of Tennessee, says creating a wetland doesn't work, and the best thing to do is not destroy one in the first place. One final note. When we first moved into our house, there was a nice area of wetland at the northern tip of Mud Island. It included large trees that were of the size to have been there for a long time. In an attempt to "beautify" Mud Island, all of the vegetation, including the trees, was removed. Over the years, it grew back. In Phase One of the Beale Street Landing, not only was all of this newly formed wetland destroyed, the tip of Mud Island was altered and large boulders were brought in to cover the entire area. At present, the boulders are keeping the wetland from reforming but are doing nothing to stop erosion of the land underneath them. As long as the wetland was present, channel dredging started out in the middle of the channel between the two wetlands (between the shore wetland still present at the foot of Beale that we are trying to save and the wetland that was at the tip of Mud Island). They didn't have to dredge near the wetlands because they prevented sediment build up and also kept the land from eroding. Now that the wetland is gone, the first place dredged is at the tip, right up next to the bank. Just that small area of wetland at the end of Mud Island made that much of a difference! First, to help keep pollutants out of the Mississippi River, I would like for all storm drains (all drains that drain into the Wolf and Mississippi Rivers) to be labeled as such. In Seattle, all drains that drain into the ocean and waterways have a large fish and a warning against the dumping of any toxic substances into them painted on the concrete in front of them. I would like for the City to have an official list of substances that should not be dumped into the drains and a hefty fine for violators. Second, at some point in the future, given that the BSL doesn't go through as currently planned, I would like to see the restoration of the wetland at the end of Mud Island that was destroyed. This could take place one of two ways. by removing the boulders and actively restoring the wetland. Or both. The Memphis Elevator: What was it? Cooper Robertson's 2002 Master Plan and others have suggested that Beale Street Landing might be reminiscent of the old "Memphis Elevator." What was it? It was a city-block-sized warehousing facility and dock that existed at Beale Street for about six years (1872-1878) until it burned down. There are no pictures of it, but it was said to be several floors high and built into the incline of the sloped landing. Goods to be shipped entered at the top floor (east side), and could be lowered by an elevator to the level of a floating dock on the west side. The lower floors were open and designed to be flooded by the Mississippi's varied levels. The significance of the South Memphis Landing to the city's river commerce changed dramatically in 1871 with the start of construction on the Vicksburg & St. Louis Anchor Line's massive freight elevator at the floor of Beale Street, which was completed July 17, 1872, at a cost of approximately $125,000. Maps indicate that the footprint of the building stretched more than a city block, from the North side of McCall Street to the south side of of Beale Street  (Figure 12), "covering nearly an acre of ground". Like a grain elevator, this facility was built as a storage and transfer building on the river landing that could handle material cooperatively among many owners. Unlike a grain elevator, this facility was built to handle "packaged" goods in crates or barrels in both large and small quantities, ready to be loaded onto packet boats from its riverside floating dock. The scant descriptions of this facility suggest that the elevator stood three or four "stories" high and open to the elements except for the top floor, which was enclosed for offices and other facilities. The structure was built so that rising river waters might inundate one floor, leaving the next higher floor operational for storage and distribution of the material to the floating dock. Though undocumented, the movement of freight up or down inside the building was likely assisted by a rudimentary freight elevator. There are no known contemporary photographs or drawings of the elevator. However, descriptions of it and a conceptual drawing of the facility are contained in the "Steamboats in the Lower Mississippi River" Manuscript Collection. According to these materials and contemporary descriptions in the local newspapers, the elevator was stepped into the embankment of the bluff, with its entrance in the uppermost floor near the high water mark. Freight entering the building at the upper floor could be stored for weeks, if necessary, before being lowered to the appropriate floor for loading onto steamboats. On July 1, 1878, the steamer Capitol City caught fire while tied to the dock of the elevator, and the strong westward winds that evening quickly spread the fire to the elevator building itself. The structure was totally destroyed. At the time, the elevator was holding an estimated 2,500 Barrels of flour, cornmeal, and tar, 600 sacks of oats, brand and cornmeal, and 700 barrels of cottonseed oil, representing the goods of 20 or more local firms. Two persons on board the Capitol City died in the blaze. The total loss was variously estimated at between $125,000 and $200,000. The pilings at the second floor level were all that remained of the great building by mid-afternoon the next day. The loss of the freight elevator was a great blow to the City of Memphis. The Anchor Line did not respond to the calls to rebuild the facility and abandoned the site instead. A similar facility, known as the Memphis Package Elevator, was built by another company in the early 1980s on the north end of the levee in the vicinity of the Mississippi & Tennessee Railroad Depot at Jefferson and Chickasaw streets. 1. Memphis Daily Appeal, 3 July 1878). 2. 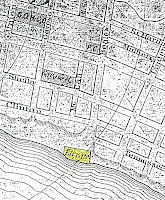 Boyle & Chapman, 1872, Map of Memphis, Tennessee. In the Boyle and Chapman Memphis City Directory for 1872-73. Boyle & Chapman, Memphis. 3. Memphis Daily Appeal, 3 July 1878). 4. Public Ledger, 4 July 1878. 5. Commercial Appeal, 15 January 1941. 10. Sholes Memphis Directory for 1882. Sholes Co., Memphis. The presentation of the Beale Street Landing plan last night was the best I've seen -- and I've seen many. The partner from Bounds & Gillespie Architects was careful, thorough, detailed, and accurate. When it came time for the Design Review Board (DRB) members to ask their questions, they came up with lots of thoughtful and interesting ones. But one very important question wasn't asked. (A couple of board members came pretty close.) Perhaps this question wasn't part of the DRB's review criteria. I wasn't permitted to ask it, but someone in this City ought ask the question and insist that it get answered. Birds-eye view of main and second pods, at Riverside and Beale. Main pod is above and behind your left shoulder. You're looking south. Near the top of the helical ramp, looking north. The helical ramp, as if seen from a big riverboat. 1. With all of the levels and terraces, stairs and ramps, pods and walls, there must be a hundred good places for someone to hide, ready to attack or rob an unsuspecting visitor, especially at dusk or at night. This is unlike Tom Lee Park -- a wide open flat space with only a statue and a tree or two. One DRB member asked whether BSL will be be fenced or gated. No, said an official. It's a public park and will be open 24/7. Another board member expressed a concern about it being an attraction for campsites of homeless people. We're assuming the police will deal with those kinds of things, said the official. In other words: There's no particular security plan. Did "the most-reviewed plan in the history of Memphis" somehow miss getting looked at by the police department? Just asking. Beale Street Landing might be, as some like to say, "the most-reviewed plan in the history of Memphis." But it is like that old story about the series of blindfolded people, each led into a room and allowed to touch a different part of an elephant – but none of them allowed to see the whole thing. You will be last sign off on the plan for Beale Street Landing – without having seen a plan of record for the Cobblestone Landing. I believe this is a big mistake. I've had a glimpse of the preliminary Cobblestone Plan. If you were allowed to see both plans together – the whole elephant – you might realize what's very wrong. 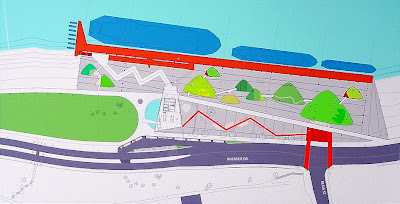 The whole plan – the "elephant plan" – is in direct contradiction to the 2002 Cooper Robertson design for the Riverfront, commonly known as "Master Plan". For example: The Master Plan said that BSL would be an enhancement for the important boat landing at the Cobblestones. The elephant plan makes BSL the only landing. Riverboats of any size will no longer dock at the Cobblestone Landing. For example: The Master Plan said that the Cobblestone area is the centerpiece of the Riverfront, with Union Avenue as its central artery. The elephant plan says that BSL is the centerpiece and that Beale Street is the main artery. I could spend my whole time on ways the elephant plan goes in the wrong direction compared to the Master plan, as well as to every plan in the past 20 years. But I will simply ask: Has that Cooper Robertson plan been forgotten? Has it been rescinded? Does it matter any more? The part of the elephant that you don't see is this: The Cobblestone Landing, which has been in continuous, active, commercial use for over 150 years, will be de-commissioned. Tourists and Memphians will no longer be able to board even the daily excursion boats at the Cobblestones. Instead, they will wait in one of those pods until boarding time, go through metal detectors and homeland security, go to the farthest end of BSL, traverse a burnt-red painted, steel corkscrew and walkway, for only as long as it takes to board, and be whisked away from Memphis. The elephant plan not only disrespects Memphis and its history, but it will surely impact tourism, by taking away a wonderful experience that is unique to Memphis. There will be no reason to for you to visit the Cobblestone area. You will just look at it from a pod. The historic Cobblestone district will become a mausoleum for those bygone days. The City of Memphis plans to decommission the boat landing that has long drawn thousands of tourists and Memphians to the historic cobblestones at the center of our waterfront. In a word: Competition. The historic landing would compete with a new boat dock they want badly to build. Six years ago, the City launched a Master Plan to aggressively develop a five-mile stretch of the Memphis Riverfront. It was to be accomplished via a quasi-governmental agency called the Riverfront Development Corporation. The RDC's board was stocked with politicians, financiers, developers, celebrities, and other power-people of the City. But that plan eventually stalled, for lack of broad public support. One piece of the plan remains: A new, $29 million, taxpayer-funded large-boat facility called Beale Street Landing (BSL). Although a new boat dock was suggested by the Master Plan, the new today's BSL would be much larger than the original concept -- which was only intended to dock the largest boats. In its eight years of existence (and despite its middle name) the RDC hasn't actually built anything except a roundabout and some stairs. The reputations of very powerful people would be tarnished if this piece doesn't get built. To help justify it, all of the boat docking that has historically taken place on the Cobblestones would be moved permanently to the new boat dock. Instead of supplementing the Cobblestone Landing, BSL would effectively replace it. The old Cobblestones would still be restored, simply because they have to be. They're considered a protected, historic district. The public would still be able to access the four-block stretch of cobblestones, but they would not be encouraged to use or even walk directly on them. The activities that have for so long drawn people to the Cobblestones and river would never return to the original, great Memphis Landing. The City has feared a backlash if the general public were to catch on. So they have kept the de-commissioning plan quiet. They will only say that they need to move the boat docking in order to fix the cobblestones. What they don't say is that the boats will never come back. Instead, the City has focused the public's attention on Beale Street Landing. They have gotten all the approvals for the new landing first, leaving the Cobblestone area plan for last. Therefore, only a few people have been able to connect the dots. 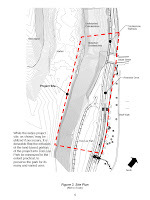 As of this writing (March 3, 2008), the Cobblestone plan is being developed. It is very preliminary (a "concept" they call it), but it is already obvious that Mississippi riverboats won't be docking there -- ever. Update, August 4, 2009: Little changed from when I saw it 17 months ago, the RDC has post a first public glimpse of the plan on their Web site, and is moving forward with final approvals. There will be a public information meeting August 11, 2009. Beale Street Landing to be named after Willie Herenton? What did the Master Plan actually say? Don't we need a new boat landing? Not everyone is into historic landmarks and relics. Oftentimes you might feel that those preservationists are just standing in the way of progress. We can understand if you feel that way. But think about this: Doesn't it make a big difference to you when it's not just something to look at, but something everyone can use and enjoy, the same way they did in the old days? Memphis is full of historic buildings. But the best ones don't just sit there, empty, for you to look at. That would be waste of space and you'd eventually tire of them. The best ones are renovated and put to good re-use -- as homes, businesses, and public amenities and attractions. That's the way it is with the Cobblestones. They're not just relics. They are part of a great commercial riverboat landing, one that has been in continuous use to this very day. Didn't you bring Aunt Martha and the family down there last summer to take a riverboat cruise? Didn't you all enjoy your experience, feeling like it was the real thing? That's because it was! Today, of all the great river landings on the Ohio, Missouri, and upper Mississippi rivers, the Memphis [Cobblestone] Landing is acknowledged to be the best preserved of these important commercial places. Sure, the City can fix the Cobblestones -- clean up the area, replace the missing ones, and give you what they like to call "access." But that will only satisfy the law, the historians, and the preservationists. If you take away their principal use, the Cobblestones' reason for being, then you've taken away their heart and soul, leaving only a lifeless relic of a bygone era. And that would soon get boring. 1. Garrow report, January 1996. What did the Master Plan say about the Cobblestones? 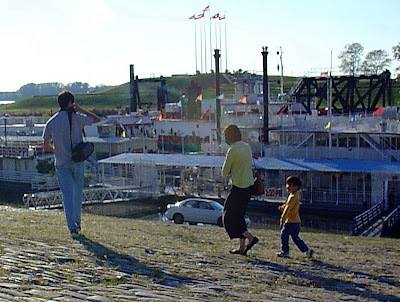 Whatever its other faults (and there were many) the Riverfront Master Plan of 2002 was correct about at least one thing: That plan clearly meant for the Cobblestone Landing to not only be seen, but also to be used and enjoyed by Memphians for boating and cruises -- just as it has been for over 150 years. Restore the Cobblestones to their historic uniqueness, and establish them as a great commercial boat landing and civic square at the foot of Union Avenue. Lest there be any doubt about whether the Cobblestones would continue to be a public landing, let's look at details of the drawings from the Master Plan. Click either drawing to enlarge. In both drawings, you'll see that the central artery and means of access is Union Avenue, not Beale Street. At Union Avenue is a pedestrian bridge to Mud Island. 1. Cooper, Robertson & Partners, Memphis Riverfront Master Plan, March 2002, p.24. It has long been believed that there should be a river terminus at Beale Street (the southern edge of the Cobblestones), providing pedestrian access to the water. In the 1990s, there were plans to locate the Tom Lee monument there. 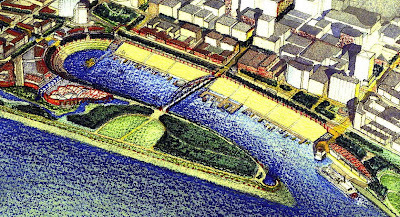 At the right is a sketch that was included in Mayor Merenton's proposals for the Riverfront circa 1997 (click to enlarge). Note: The Memphis Elevator was a big building, a multi-floor structure with warehousing at the top level and docking openings at each lower level. It did not look like a red steel helical ramp. Read more here. It is anticipated that at least two specific river cruise operations will use the docking facility: 1) Delta Queen Lines (Delta Queen, Mississippi Queen, and American Queen), and 2) River Barge Excursions (R/B River Explorer). Note: The Delta Queen Lines and River Barge Excursions have since gone out of the business of running overnight Mississippi cruises. Note that BSL doesn't cover anything north of the edge of Beale Street, and leaves Tom Lee Park alone. The original cost estimate was $10,375,000. 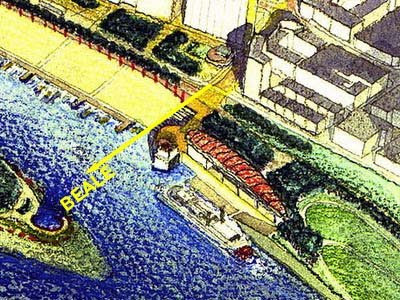 In December 2002, the RDC launched an international design contest for the Beale Street Landing component. After nearly a year of receiving and reviewing entries, the winning design came from a firm in Argentina. The jury of seven included only three Memphians: Willie Herenton (a mayor), Diane Dixon (an architect), and Kristi Jernigan (a developer, who has since moved away). 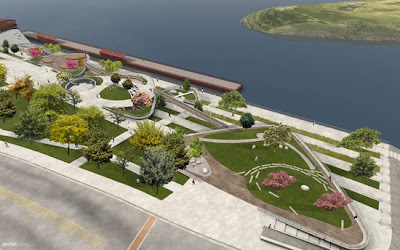 The RDC competition documents had offered the architects a huge space to work with, extending well into the historic Cobblestones, and including a section of Tom Lee Park. Click drawing at left, and note that the red box extends will into the historic Cobblestone area. The winners used every bit of that space with their design. It included not only a huge dock, restaurant and parking, but also a sprawling public park with up to eight "islets" or pods of varying heights, that would be above or below the water level at different times of the year. In the four years since, Beale Street Landing's design has been altered considerably, but it retains most of the flavor of the original design, including the five largest pods. It is also even larger: Because the underground parking wasn't feasible, now even more of Tom Lee Park is going to be consumed by a parking lot. It will cost Federal, state and local taxpayers over $29 million. 1. Cooper Robertson & Partners, The New Memphis Riverfront. 2. TetraTech Inc, Beale Street Landing Preliminary Design Competition Program, page A-6. A state-of-the-art facility for docking of the largest commercial cruise boats might be a nice-to-have. It was contemplated in the Riverfront Master Plan. But is Beale Street Landing really necessary? For a period of about three years (2002-2005), it did appear that a new big-boat landing would eventually be needed, but now that is no longer true. Furthermore, the overnight cruisers are out of business and dry-docked, and if they ever started running again, we could receive them at Mud Island River Park. Therefore: No, we don't need Beale Street Landing. The largest, overnight riverboats have long picked up passengers at the Mud Island River Park landing. They had stopped using the Cobblestone Landing some years ago because their big thrusters did too much damage to the Cobblestones. At times when the water level is too low to for them to enter the harbor, the boats have docked at the north end, on the river side, of Mud Island. The day cruisers (Memphis Queen) embark from the historic Cobblestones. Smaller pleasure boats use the Yacht Club facilities. Although the Mud Island facilities could be improved, there wasn't (and still isn't) a critical need to build a new landing. That forced the issue. If we didn't create a new dock for the larger boats, we'd never again have the thrill of seeing these magnificant ships coming near or into our harbor. So the Master Plan proposed a new docking facility for those large riverboats, while recommending we continue to use the Cobblestone Landing for other boats just as we have for 150 years. In early 2006, the City Council voted to eliminate the land bridge from the Master Plan. That put us right back in the situation we had before the Master Plan, where the big boats already have adequate landing facilities at Mud Island, which they have used up until 2008. 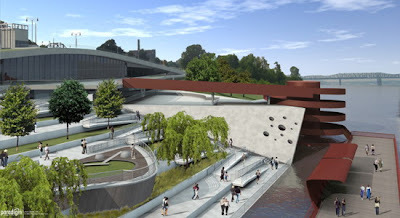 RDC had already gotten deeply involved in the designing and planning for Beale Street Landing. Reputations were at stake. With the land bridge project canceled, and nothing else to build, they were more committed than ever to see this project through. And somewhere along the line they decided it should be the primary facility for all boats, including the Memphis Queen Line now boarding at the Cobblestones. Then, in 2008, the RDC's plan suffered another blow: The two largest Mississippi cruise companies went out of the business and put their riverboats into drydock. No other company has stepped forward to restart the business. There is no way to know whether these riverboats will ever run again -- especially in the current economic climate. We are building a $30+ [updated: $37-40] million facility that is no longer necessary, meant for the largest riverboats that are no longer running, and justifying that cost by relocating the medium sized day cruises away from the famous and historic Cobblestone Landing, that has been used continuously for 150 years. Click here to listen to the audio of my remarks (8:14 minutes). This low-bitrate MP3 file should be suitable for online listening, or for offline use as a podcast. The full text of my remarks follows below (click to read). There is an elephant in the room. You can't see it because the furniture has been arranged so that you have your backs to it. So let me describe it for you. What Landmarks Commission is rightfully concerned about is whether Beale Street Landing, if and when it is built, might adversely impact the landmarks and historic districts we already have. More specifically: How might this artificial landmark impact the authentic landmark right next to it, the Cobblestone Landing? The Memphis Landing is perhaps the one historic resource that best exemplifies the scope of the City's history. When constructed during the nineteenth century, the Memphis Landing was second only to the St. Louis city landing in its scale and level of commercial activity. Today, of all the great river landings on the Ohio, Missouri, and upper Mississippi rivers, the Memphis Landing is acknowledged to be the best preserved of these important commercial places. The Cobblestone Landing has been in continuous use for over 150 years. Even today, it is a popular tourist destination and a place where people may embark on riverboats, just as they did in the 19th and 20th centuries. A few days ago a preliminary plan to restore the Cobblestone Landing was presented to a small group of stakeholders. It confirmed many of my fears about the future of the Cobblestones. Members of the Commission, we have done this whole process literally backwards. We are preparing to start work building an artificial landmark, without having a plan of record for the real landmark. And, as a result, we're not seeing the full impact Beale Street Landing will have on the Cobblestones. What we're not seeing is that Beale Street Landing expects to take over the public activities from the historic landmark. The Cobblestones will get fixed, yes - but those activities will never come back. 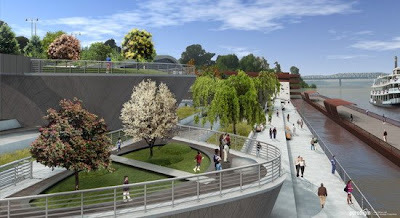 The City says that Beale Street Landing is guided by the overall vision of the Memphis Riverfront Master Plan of 2002. That is not true. The design that you are being asked to approve is quite different from what was described in the original Master Plan. The Cobblestones are Memphis’ most treasured historic river resource. No credible Master Plan could be put forth without their inclusion. In fact, the Cobblestones are situated in the most strategic Downtown location, at the foot of Union Avenue. In order to have a successful Downtown Harbor and riverfront, the Cobblestones must be greatly improved from the vast eyesore that they are today. … The Cobblestones themselves must be properly reset and retrofitted in an historically sensitive manner with state-of-the-art services and dock facilities needed by commercial riverboat operators. … The entire length is proposed to become the riverwalk esplanade, establishing the Cobblestones as the new civic centerpiece of Memphis’ riverfront. To put it simply: The Riverfront Master Plan called for the Cobblestones, not only to be seen, but also to be used and enjoyed, as a vital and active part of our living waterfront. The Master Plan called for this treatment, just as did the Garrow Report in 1995-96, just as did the Center City Development Plan for the Riverfront in January 1987. But that's not what will happen if the current plan for this project is executed. 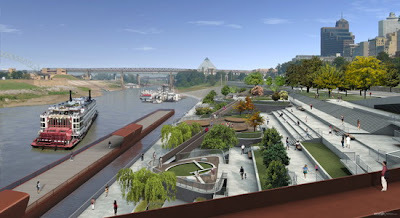 In the current plans for these two neighboring projects, the Cobblestone Landing will be repaired and restored, but its historic and current uses will all be removed – moved to Beale Street Landing - in effect, making the Cobblestone Landing a mausoleum for the bygone history of Memphis. Mausoleum is my word of course, but I think it's appropriate. With a historical marker or two, the Cobblestones will, at best, become a brief stop for the tour buses, before they move on to Beale Street Landing. Neither tourists nor Memphians will feel compelled to stay, and experience, much less use the Cobblestone Landing as they do today. Boats will no longer dock here. There will be some walkways and some historic markers, but the Cobblestone Landing will become a large field of rocks, devoid of activity, in the center of the riverfront. Instead of enhancing the Cobblestone Landing, Beale Street Landing clearly supplants it, and (if you are seeing the elephant now) hopes to replace it. It is two and one-half times as large as originally planned. It now consumes part of the north end of Cobblestones, and a whole section of Tom Lee Park. How about that restaurant at Beale Street Landing? It's not a new proposal. The Mayor's 1996 riverfront plan envisioned a “floating restaurant" right at the foot of the Cobblestones. What a great idea! But now that restaurant will be at Beale Street Landing. All of this amounts to a profound negative impact on a historic landmark. In another 20 years, I predict, someone will be asking whether we need the Cobblestones at all. It’s a familiar tune. We've seen it all over town. Brand new shopping malls go up, siphoning stores and business from older malls, leaving them derelict, with our historic neighborhoods paying the price. And we saw it with FedEx Forum, not just making the Pyramid useless, but also with a covenant not to compete that affected entertainment venues citywide. How did we get to this point? Again, I say: We did it backwards - by designing Beale Street Landing first, and leaving the Cobblestones to become an afterthought. This is how things go wrong when we do the process backwards. And the community pays the price. We request that you defer approval of this project until you are presented a fully realized plan for preserving and revitalizing the use and enjoyment of the most important landmark on our riverfront. Compliance with the City's 1995-96 Preservation Plan would require the two locations be considered together, as a single plan. Only when you have both plans in front of you will you be able to evaluate whether this project will have a negative impact on the historic district and adjoining landmark. Only then will you be able to consider whether Beale Street Landing is an appropriate design - or needs to be redesigned. As the Landmarks Commission, your stated purposes include: "to preserve and protect…historically significant areas," and "to promote the use of Historic Districts for the education, pleasure, and welfare of the present and future citizens of Memphis." Appropriateness isn't only about the color of paint. It is also about the continued use and enjoyment by the public of an important historic landmark. Please do not allow yourselves to be cornered into approving Beale Street Landing when its design is clearly intended to overshadow and ultimately replace the authentic landmark you are supposed to be preserving and protecting. Your vote is important, and you should not be asked to support any project without having full information and the time to carefully consider and analyze the new project’s potential negative impact on a historic site. Please don't be made an unwitting signatory to the demise of the Cobblestone Landing. 1. Commercial Appeal, "Lode of past beckons under cobblestones," November 21, 1994, p. A-1. 2. Garrow & Associates, Inc., Memphis Landing Cultural Resources Assessment and Preservation Plan, City of Memphis, Shelby County, Tennessee, Part 1: Cultural Resource Assessment (Draft), January 1996, p.80.